A few days ago my roomate and I were talking about World of Goo. Last night, he booted up his Mac, while I tried to figure out how to get it running on Linux. This morning I found that 2D Boy had my install files still available on their website (score!!). Within minutes, I was creating towers of goo using my Wacom tablet. Yes, this game is super tablet friendly under Mac and Windows. Though a little glitchy under Linux (probably due to the resolution change), it can be done with a Wacom. Today I took a look at the 2D Boy blog and discovered that, in a few days, World of Goo will be available for Android! OOoooh boy. So for about $5 ($15 less than the current PC download price), I will have another time-waster on my Galaxy Tab? This game was born for touchscreen, and on November 28th, all shall be right in the world. World of Goo was created during a rapid prototyping session at Carnegie Mellon. Details of this development cycle are here on Gamasutra. Jerry Levitan, creator of I Met the Walrus, directs this new animation with Yoko Ono narrating. Watch My Hometown for an inspiring message about directing positive energy in order to improve communities, whether local or distant. Google’s front-page tribute to Martha Graham‘s 117th birthday was animated by Ryan J Woodward. A few months back I had posted a link to his animated dance film “Thought of You“. I’m glad Google gave me an excuse to mention this fantastically inspiring short again. Again, I can’t stress enough… if you haven’t seen his “Thought of You” short film, check it out here. Working in the animation industry, it’s almost impossible to not have heard of Richard Williams. His Animator’s Survival Kit is a bible for most character animators. Every studio that I have worked at, had at least a half dozen copied floating around. A few years ago, Richard also made his live lectures available on DVD. The price is now down to just under $1000 USD. Wiki says that this animator/director was born in Toronto, Canada in 1933. Richard Williams is best known as the director of Who Framed Roger Rabbit. Apparently, Williams had also directed 3/4 of the Raggedy Ann & Andy, “A Musical Adventure“. Here’s a great clip of the iconic dolls floating around in a living lake of sugar, via Scribble Junkies. According to the Scribble Junkies thread, the primary animator for this shot was Emery Hawkins. If you liked that, I recommend checking out Michael Sporn’s blog, where you can find pages and pages of behind the scene materials, including the original timing sheets. There is also a “The Animated Raggedy Ann and Andy: An Intimate Look at the Art of Animation Its History, Techniques, and Artists” book, that sounds like a good collector’s item. Finally, it’s difficult to talk about Richard Williams without mentioning his film, The Thief and the Cobbler. If you appreciate his work, I recommend taking 2 hours to see the mostly finished Recobbled Cut“, which is available, in it’s entirety on Youtube. Here’s one entertaining way to help train yourself to read music… as well as provide a little subliminal programming…? “Thought of You”, created by Ryan Woodward provided me with an inspiring dose to add to my breakfast this morning. He also has some beautiful figure sketches on his website that I recommend taking the time to see. Thanks to Dan Laczkowski for getting me to seriously check this out. The following link will lead you to a demonstration by Android Jones. Thanks to Rachit for this killer link! The rain is starting to get to me. Luckily, I have a rain coat, so I can still go for walks… but it would be nice to see a little light when I’m out. Looking at getting a cheap car so that I can get out of here and see some more of the state. Originally a VW Golf… but now I’m looking at a Jetta. Little stylish, great gas mileage and just enough style. Leaving for Vancouver for the weekend in a few minutes… but wanted to first do a quick update and dump a quick doodle online. Come back Sun… you’ve been missed. Lines to Blog from verbal007 on Vimeo. First week of working with Travis is complete. We met our deliveries, despite all the setbacks with all the setting up. Computers. GAH! We have full confidence that the second time around will be 1/3 the time. Learning tons from each other. I have really missed this kind of collaboration. Sometimes they can have light and simple tools that mimic traditional tools that we find in real life. Plastic Animation Paper is one of those tools. The free version allows you to play around and export little animations. Here’s one of the 4 doodles I’ve done in the program. I enjoyed every second of it… and you can expect to see more. Plastic Animation Paper – Test 1 from verbal007 on Vimeo. There is something magical about creating something for the sake of creating. No money or deadlines to steer you. Each step is spontaneous. Donating a copy of the Dragonlance Chronicles to our studio library. In my search for images, I discovered that the first book was made into an animated movie, back in 2007. Can’t believe I hadn’t heard of it. A classically animated short created by Michael Dudok De Wit. Simple yet beautiful. Powerful use of the music to tell the story. If you like this short and can handle seeing something a little more simple, Father & Daughter is also worth checking out. Thanks to Des Duggan for getting me to check this out. Eric Goldberg directed 2 shorts in Fantasia 2000. He animated the Genie in Aladdin. He’s currently animating on the upcoming “The Princess and the Frog“. He is also author of the Animation Crash Course. What else? His credit list is huge, look it up. Although it came out last year, I just listened to Part 2 of Goldberg’s podcast interview. Many animators would say that this stuff is common knowledge, but as a technical 3D guy who doesn’t deal with this kinda stuff on a daily basis, it helps to hear it from someone with such experience. What are some of the bits I’ve learned? In regards to FX or secondary animation, in 3D, with everything we get for free, we loose control over key story telling elements. He gives the example of the fur in Monsters Inc. It’s all controlled dynamically, but if it’s dynamic, we cannot use the fur as a tool for enhancing the movement, or even the emotion. He notices how rigs are usually animated via the torso first, and how this makes CG walk-cycles feel very floaty and difficult to feel the energy. He sometimes approaches his animations from the eyes outwards, drawing the eyes first, then the nose, then the cranium around the eyes. The expression builds the shape. If you want to hear about Goldberg’s recollection of animating Robin Williams as the Genie, or directing Pocahontas, check out the podcast over at AnimationPodcast.com. I’ll have to go back and listen to Part 1, as I’m sure there’s great stuff there also. 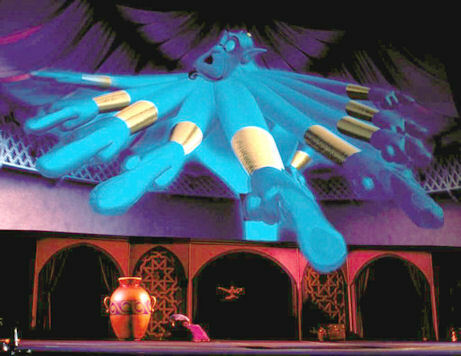 Finally, I have to include a link to a clip from the Magic Lamp Theater @ Disney Sea in Japan. I had the pleasure of working with Teunis de Raat, who worked with Goldberg in order to make this 3D version of the Genie come to life. That must have been one hell of an experience. Maybe I can convince him to divulge some details. This one time… from nelson boles on Vimeo. Thanks to S. Clee for this one. Procedurally animated art game? These little toys are sure to warm your heart. Simple and brilliant. Please take a moment to checkout some of the work on Vector Park. Taking it a little further than the text. Make sure and crank up the volume before getting this one rolling. Davario on Livejournal created a post where hundreds of artists are now drawing portraits of themselves, past and present. It first started as a simple “draw yourself as a teen” post and then BOOM it exploded into a meme. There’s a huge list of sketches that have been submitted, with a wide range of skill levels. I’ve only gone through a dozen or so myself, but I plan on spending more time later, here and there, checking out the rest. Take a look at this impressive list of portraits.